Every year, the Japanese wait impatiently for the brief moment they are able to delight in the cherry blossom. People gather along the banks of the Kyobashi River in Hiroshima to contemplate this fleeting beauty. Japan is in the grip of cherry blossom fever once again. As the blossom front sweeps from south to north at about 30 kms a day, people throughout Japan are busy scouring blossom maps to plan the best day and place for their hanami blossom-viewing party. Some have already laid out their blue tarpaulins to reserve a place under their favourite tree. Meanwhile, paper lanterns are being hung in cherry trees along river banks and in parks, stalls are set up ready to sell everything from grilled squid, takoyaki octopus dumplings and beer. Lots of beer. Let the hanami commence! Why all the excitement? “Transience forms the Japanese sense of beauty,” says Zen priest and garden designer Shunmyo Masuno. Traditional culture such as haiku, the tea ceremony, and moonviewing all share a sense of celebrating the ephemeral beauty of the seasons, and of each unique, never-to-be-repeated moment. And sakura blossoms, spectacularly pretty and touchingly short-lived, are the epitome of this philosophy. The blooms are only at their best for a week to ten days, depending on the weather. One heavy rainstorm or one windy day brings them fluttering down in a blizzard of blossom. All too soon the spell is over, the country loses its pink mantle, and reality returns. It’s precisely because cherry blossoms are such fleeting beauties that the Japanese celebrate them so fervently. The practice of hanami goes back over twelve hundred years to the Nara Period (710-784). At that time, plum trees, which blossom a month earlier than the cherry, were the focus of the celebrations. Hanami only became synonymous with sakura during the Heian Period (794-1185). Back then, hanami parties were only for the aristocracy and court nobility, who were fond of contemplating the blossoms and composing poems about them. 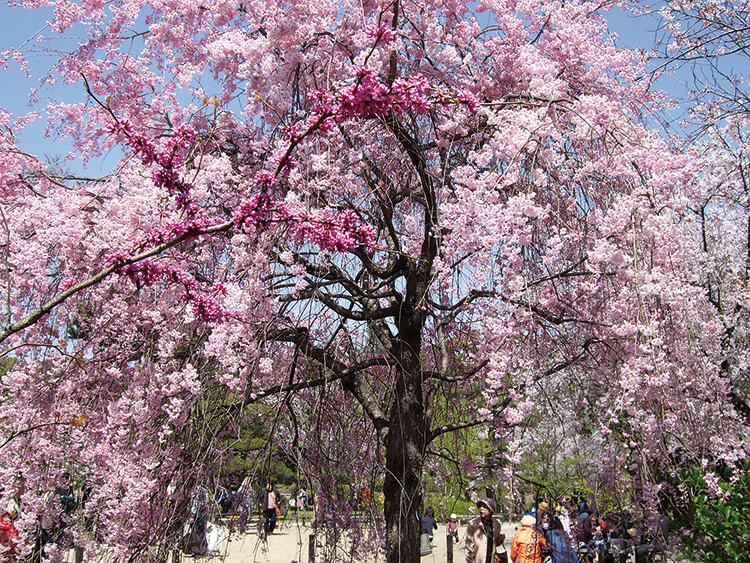 But as horticultural techniques developed, cherry trees were planted in public parks, temple gardens and along river banks so the population at large could enjoy hanami too. With so many blossoms to see in such a short time, planning is crucial. Don’t fancy the popfestival- sized crowds packing the cherry blossom spots in the big cities? Then why not head out to the sticks for a more sedate alternative down in Chugoku, the westernmost region of Honshu, Japan’s largest island? Even down here, solitude isn’t really on the agenda. There’ll be crowds wherever you go. But the collective element is an important part of hanami, and at least the crowds will be mostly locals, the atmosphere warm and welcoming. Blossoms in this area peak from late March to early April. Exact dates vary from year to year depending on the weather. Watch the TV news or blossom viewing websites for daily regional updates. Blossom maps detailing the best viewing areas can also be seen in train stations. One delightful area that relatively few foreign tourists have discovered is the Seto Inland Sea and its maze of misty islands. With their gentle climate, spectacular scenery and laid-back lifestyle, these enchanted isles are a great visit any time of year. At cherry blossom time, it all gets quite sublime. Start off at the historic port town of Onomichi, 90 kms east of Hiroshima. 10,000 cherry trees brighten the mountainside in a glorious display that ranks among Japan’s 100 best hanami sites. From Onomichi you can walk, cycle or drive along the 60 kms of roads and bridges of the Shimanami Kaido to the heart of the islands. Particularly spectacular is Kosanji Temple on Ikuchijima Island. This large temple complex boasts life-size recreations of some of Japan’s most historic temple buildings. In April, the whole sublime scene is afloat on a pink cloud of cherry blossoms. If mountains are more your thing, head up to Haji Dam, up in the mountains of the Akitakata area in north-central Hiroshima Prefecture. There you’ll see Yachiyo Lake, a vast reservoir surrounded by 6,000 cherry trees. The sight is especially magical at dusk, with the lanterns glowing and the smoky tang of festival food wafting up from the yakisoba and fried chicken stalls. The broad lake lends a wonderfully spacious feel to the area, so even when it’s crowded it never feels claustrophobic. You may even glimpse a deer or wild boar coming down from the surrounding forests. The city of Hiroshima is home to two UNESCO World Heritage sites, and both are popular hanami venues. One is the island of Miyajima, famous for its floating shrine and red torii gate rising out of the sea. The 1,300 cherry trees around the shrine area are enchanting, despite the crowds. The other is Peace Park, opposite Peace Memorial Dome, on the banks of the Motoyasu River. 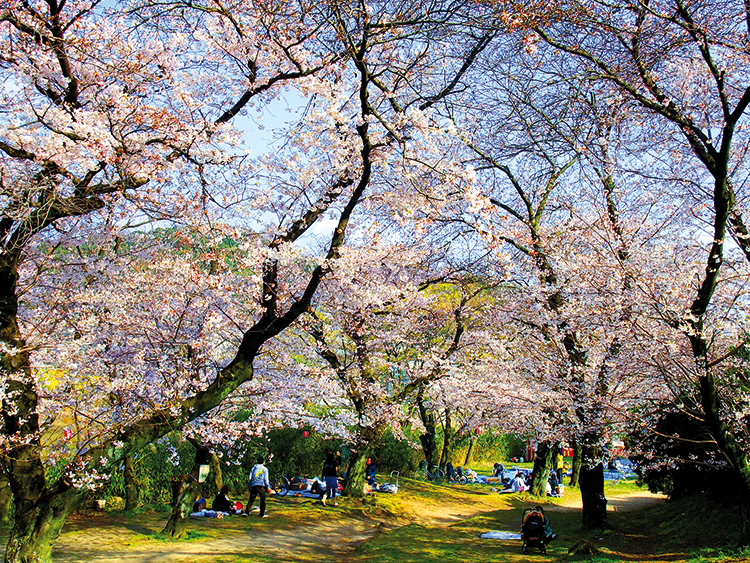 Some of the city’s most lively hanami can be found here. But many visitors don’t know what to do once they’ve seen these two places. To get a real feel for the spirit of the city, get a bit more adventurous and check out the sites that the locals visit. Hiroshima Castle is a good starting point, with cherry trees lining its broad moat. You’ll probably see the occasional young office worker sitting all alone for hours on end in the middle of a huge blue tarpaulin. It’s common for companies to send one of their recent recruits to guard the spot ahead of the office hanami party later in the day. A short walk will then bring you to the banks of the Ota River, which stretch in a virtually unbroken corridor of blossom from Peace Park all the way up to the suburb of Ushita. After dark, and a glass or two of sake, the banks transform into a surreal cotton-candy grotto. Alternatively, treat yourself to a River Taxi, and view the riverbanks full of blossom from a motorboat. Hiroshima is, after all, known as the City of Water, with six rivers coursing through it. The resulting miles of riverbank are virtually all lined with cherry trees. Shukkeien Garden, designed in 1620 by Ueda Soko, is one of Hiroshima’s residents’ favourite places to contemplate the cherry trees in blossom. Shukkeien Garden is a city centre oasis built in 1620 by Ueda Soko, a samurai warrior who became a Buddhist monk, tea-master and landscape gardener for Asano Nagaakira, feudal lord of Hiroshima. Consequently, it’s a place which is very dear to the hearts of Hiroshima people. It’s also a popular spot for wedding photographs, so you’re sure to stumble across newlywed couples in their sumptuous kimono, with an entourage carrying cameras and large reflector discs. Shukkeien is particularly romantic in the evening when the blossoms are illuminated. Down at the eastern end of Peace Boulevard you’ll see Hijiyama Park, home of Japan’s first public Modern Art museum, which rises above the surrounding hillside forest. Several charming blossom-viewing spots dot the hillside, including the area around Henry Moore’s massive bronze Arch, which frames a panoramic view of the city. Want to walk in the footsteps of the samurai? Across the border in Yamaguchi Prefecture lies the castle town of Iwakuni. The hanami activity centres around the splendid Kintai Bridge, one of Japan’s Top Three bridges. It’s a five-arched wooden structure spanning the Nishiki River, originally built in 1673 without using a single nail. In those days only samurai were allowed to cross it. These days, for a modest toll of 250 yen, we commoners can meander across like gentry, too. A more iconic backdrop for a hanami party would be hard to find. If you’re fortunate enough to find yourself in Japan as the blossoms begin to open, you, too, will be seized by the irresistible urge to get out and hanami. So get yourself a plastic sheet to sit on, grab a scrumptious bento lunchbox and your drink of choice from the nearest supermarket or convenience store, head for a park or riverbank, and join in the fun!